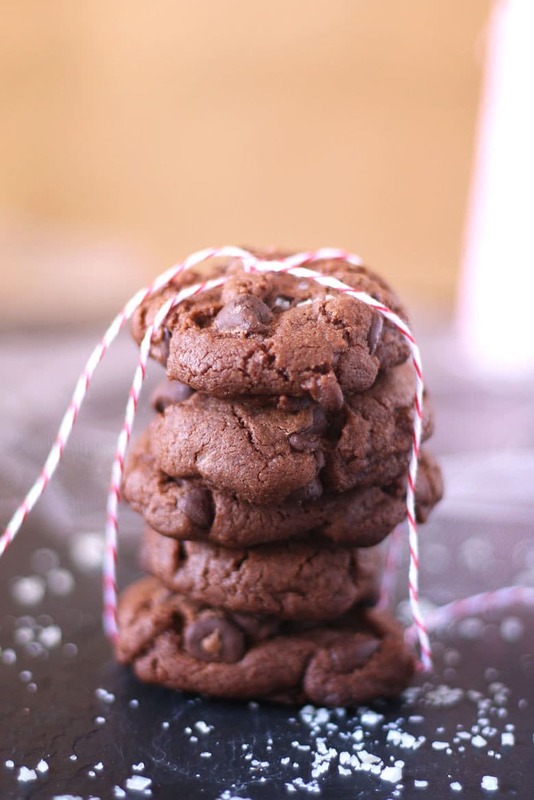 These sea salt double chocolate cookies are a crowd favorite. 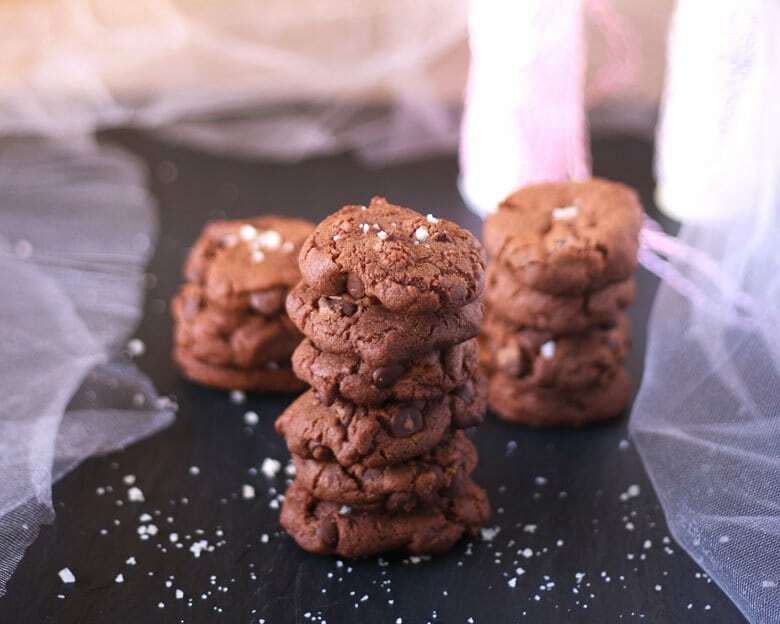 You can’t say no to extra chocolate with sea salt in cookie form! Do you know what’s better than chocolate? Lots of chocolate topped with sea salt. I know, I know. It’s not for everyone. The sea salt, that is. But I doubt anyone will deny that chocolate on chocolate is a bad thing. I made these sea salt double chocolate cookies for a cookie swap I participated in two years ago and they were a hit. I made them again for two separate family Christmas parties and there wasn’t a single cookie leftover. That is saying a lot because my family Christmas parties are definitely heavy on the desserts. I even saw them being used for an online cookie swap from another blogger. To me, that means these cookies are some kind of special. 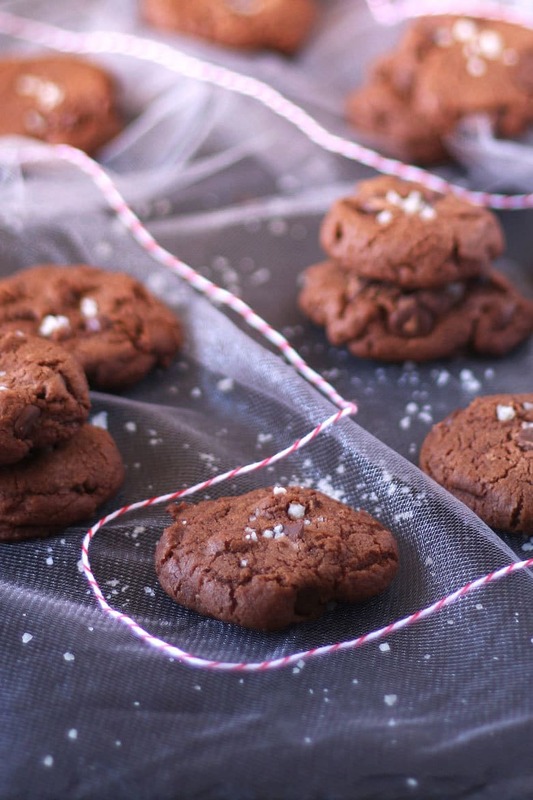 Sea salt double chocolate cookies are very easy to make. If you use the same amount of cookie dough as I did (detailed in the recipe directions,) they should be done baking in under 10 minutes. Using melted butter is my “quick cookie trick.” I often want to make cookies in a hurry but don’t have time to wait for butter to soften. No need to wait with this recipe. I use it in cooking a lot and it fell out of the cupboard while I was trying to figure out what I wanted to bake. I took that as a sign. I had a few hiccups when I was making these and detailed them in another baking post – rather than go through it all over again (I’m trying to move on!) head over there if you are interested. Note to self: don’t lose your recipe notes. 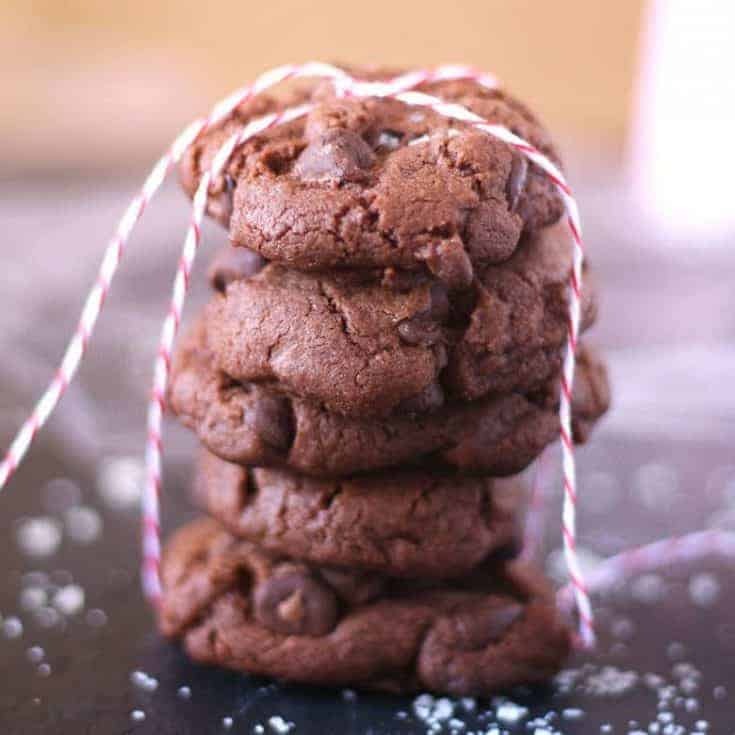 These sea salt double chocolate cookies are a crowd favorite. You can say no to extra chocolate with sea salt in cookie form! Pre-heat the oven to 375 degrees. Line baking sheets with parchment paper or silicone baking sheets. In a medium bowl, combine the flour, cocoa powder, baking soda and salt with a whisk. Set aside. In the bowl of a stand mixer, cream together the white sugar, brown sugar and melted butter on high. When that is well mixed, reduce the speed to low and add the egg and vanilla extract. When this is well combined, slowly add the set-aside flour mixture until just combined. Then fold in the chocolate chips using a spatula. Using a tablespoon measuring spoon, measure out the dough. Place the cookie dough one inch apart. Press the top of each cookie with a spoon or the flat side of a knife to flatten the cookie, just a little. Sprinkle the top of each cookie with a little bit of sea salt. Bake for 9-10 minutes, or until the cookie edges look browner than the dough. Remove from the oven, let cool on baking sheet for 10 minutes, then let them finish cooling on a baking rack. 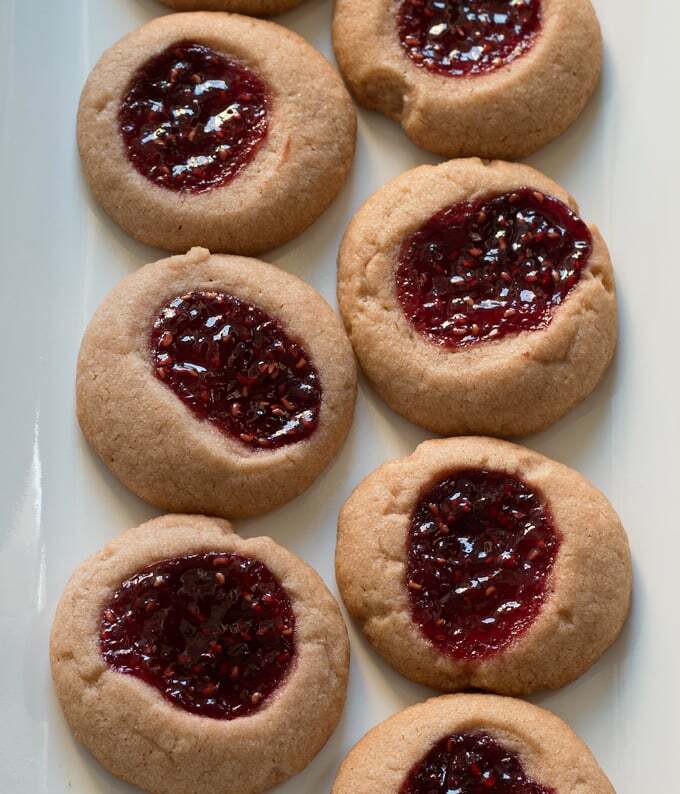 Try these raspberry chocolate shortbread thumbprint cookies. 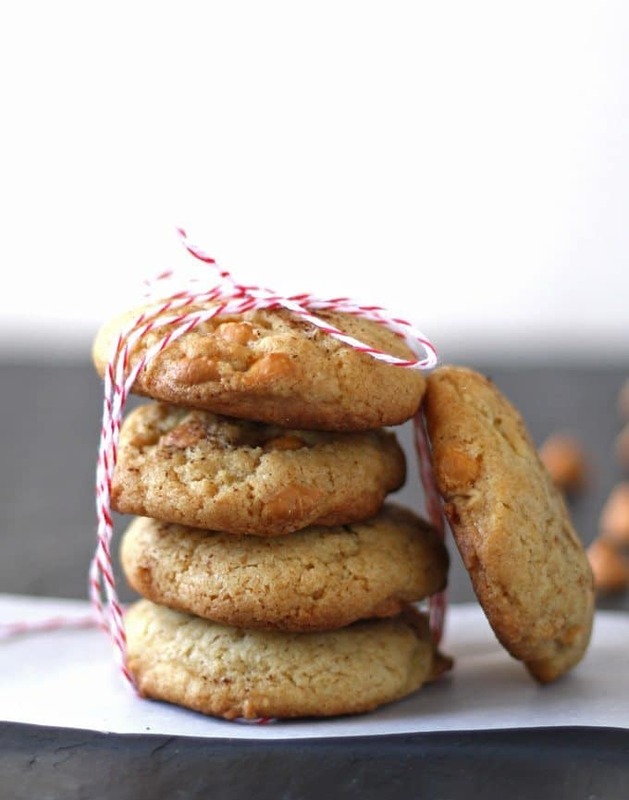 Or these butterscotch spice cookies. Thank you so much for our cookies. We loved them but I have to tell you I am totally in love with your business cards. These look so delicious!! I have a slight obsession with anything sweet that has salt on top. Can’t wait to try them out! Thanks Sarah! My hubby was leery at first because of the salt, and then ate them all. 🙂 I hope you like them too! Awesome Tina! I hope he likes them as much as my hubby did. 🙂 Have a great day! I’m glad you enjoyed the cookies! The sea salt in these cookies sounds excellent. I’m always a fan of a little salt in baked goods, especially with chocolate. These were delicious! Great recipe! Also sprinkled a little bit of cinnamon on top with a generous amount of sea salt to add a little festive twist! Yum! I think these cookies might just be my new favorite! They look absolutely gorgeous and irresistible! 🙂 Pinned! Wow! These look delish! Great photos, too. I wish I could eat a handful of these, but I have to limit my chocolate intake due to a heart condition. I know my family would love them, though! Thanks for linking up at Daisy Cottage Designs’ Off the Hook Monday! Thanks Lou Lou Girls – I’ll be there on Monday! Hi Jenny! I have made these two times and apparently I am not mature enough to have them in the house! I have my hand in the cookie jar all day! Some of the best cookies I have had and believe me, I have had me some cookies 🙂 Using as my Food Blogger Cookie Swap recipe and of course will give you top billing! Beautiful photos – love your site! These look delicious and your pictures are fantastic. Love how they are stacked and sprinkled with sea salt. Yum! These look incredible! I can’t believe I am even thinking about food after Thanksgiving, but these look awesome! Lol, I hear you Gigi – I am surprised I have eaten anything at all these last few days. This looks like an wonderful recipe! Thank you for sharing it with us at Snickerdoodle Sunday! Pinning to share! 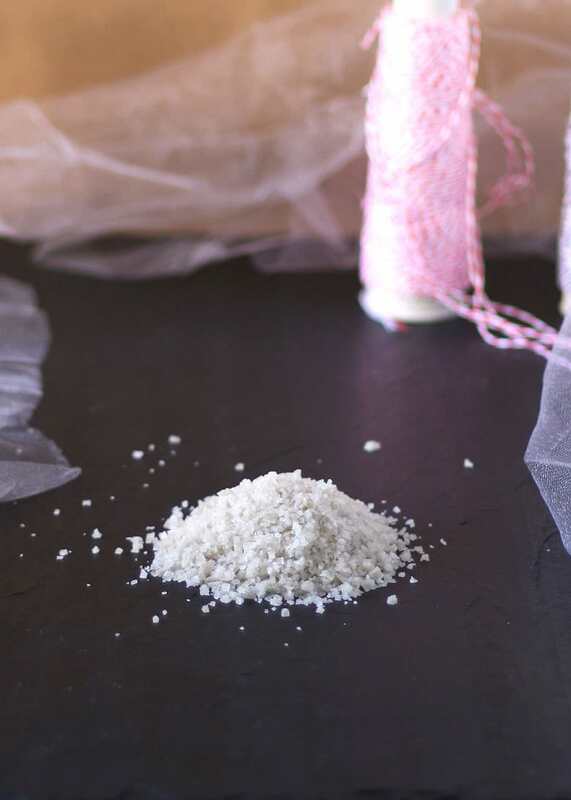 There is something about sea salt that makes things taste better. Thanks for sharing on Creative K Kids’ Tasty Tuesdays link up. Hope to see you back next week. These look delicious, Jenny. I love the combination of flavors. Pinned and Tweeted. I’ll be featuring your cookies at tomorrow’s Snickerdoodle Sunday Party. Looks so yummy Pinned & shared. I know I’ll try these this holiday season. Can’t wait. Happy Holidays! Thanks for joining in the Inspiration Spotlight party. Yummy, these look so tasty. Sea salt has been my kryptonite this year so these will suit me quite well. Thank you for sharing with us at Throwback Thursday we hope to see you again this week. What a fun swap! These cookies look and sound delicious! Thanks so much for linking up to the Handmade Hangout! I’ll be featuring you on my blog when the new linky goes live today at 6pm ET. Hope you’ll stop by and link up again! I’m hooked on sea salt and I love it in sweet foods! Thanks for sharing on the What’s for Dinner Link up! Those cookies look amazing! Thanks for sharing. Stopping by from Inspiration Monday. Sea salt is totally my thing, and these look absolutely delicious!! I love sea salt and chocolate – these would make such great holiday gifts, too! How many cookies does this recipe make? I’m doing a cookie swap. Hi Lesslie. This makes approximately 3 dozen cookies.